Originally created as work vehicles for farmers, contractors, and delivery; pickup trucks have evolved to provide growing appeal as open bedded personal vehicles for an increasingly wide range of users. Today, changing lifestyles, work needs and economics are creating greater opportunities for pickup, or open bedded vehicle, designs in varying shapes, sizes and capabilities to meet these growing new market segments around the world. Created by Michelin in 2001 to encourage and recognize young designers, the Michelin Challenge Design has become one of the most prestigious global design competitions, thanks in part to its jury members, who are often the advanced design leaders for major automakers. Since its inception, the competition has drawn more than 9,000 entrants from 123 countries. 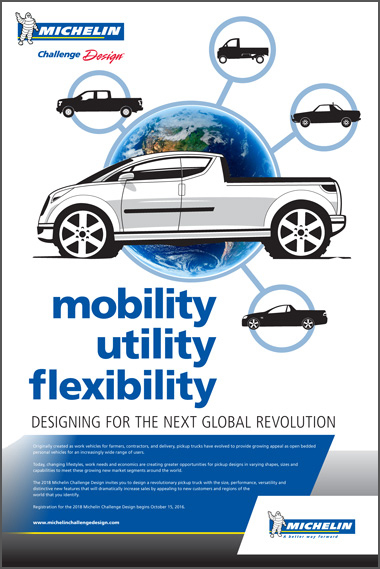 The 2018 Michelin Challenge Design theme, “Mobility/Utility/Flexibility: Designing for the Next Global Revolution,” invites entrants to design a revolutionary pickup truck or open bedded vehicle with the size, performance, versatility and distinctive new features that will dramatically increase sales by appealing to new customers and regions of the world the entrant identifies. Dedicated to the improvement of sustainable mobility, Michelin designs, manufactures and sells tires for every type of vehicle, including airplanes, automobiles, bicycles, earthmovers, farm equipment, heavy-duty trucks and motorcycles. The company has earned a long-standing reputation for building innovative premium tires. Since 1989, Michelin has received 80 J.D. Power tire customer awards – five times the number of all other tire manufacturers combined. In addition to tires, the company also publishes travel guides, hotel and restaurant guides, maps and road atlases. Headquartered in Greenville, S.C., Michelin North America www.michelinman.com employs more than 22,700 and operates 19 major manufacturing plants.